Does your dog suffer from a fear of thunderstorms? Does his demeanor change whenever the storm clouds roll in? Thunderstorm phobia is a very common condition among dogs all over the world. The terror that results from thunderstorms can be an incredibly distressing, debilitating problem not only for dogs, but also for their owners who feel powerless to help. 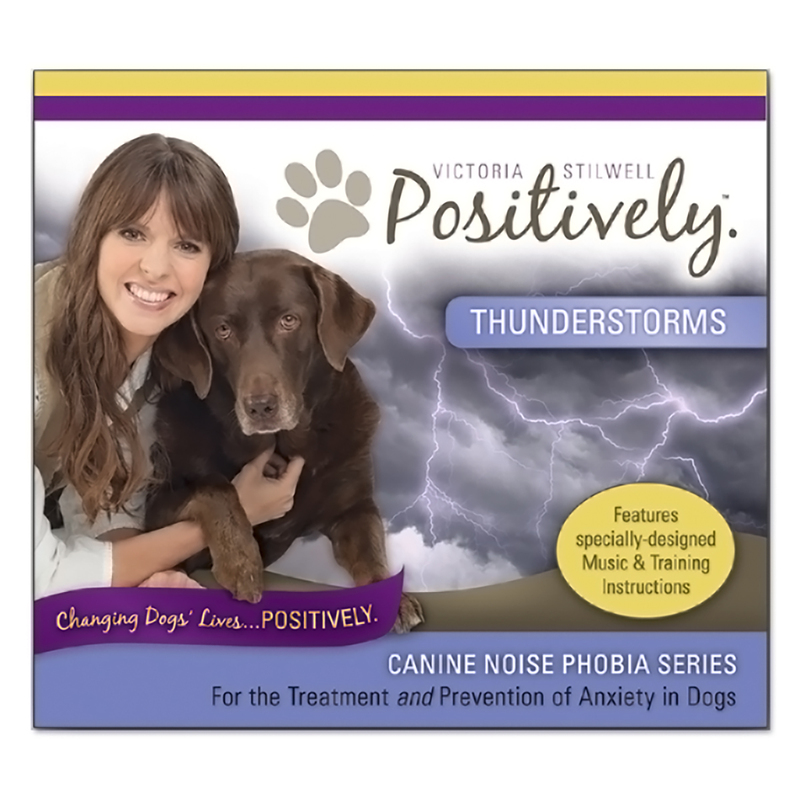 The Canine Noise Phobia Series can help dogs overcome their fear of thunderstorms, and can also be used to help prevent thunderstorm phobias from developing in other dogs. It’s Me or the Dog’s Victoria Stilwell and the creators of the popular dog-calming music series Through A Dog’s Ear have joined forces to develop this groundbreaking and powerful new approach to dealing with noise phobias and sound sensitivities in dogs. The dog first learns to associate positive feelings with the music on the CD. Once he is calm and relaxed, thunderstorm noises are slowly introduced alongside the music at gradually increasing levels while the owner continues to provide positive experiences. Eventually, the dog is able to function normally during even the most intense thunderstorm activity. To learn more, visit www.CanineNoisePhobia.com. “As a dog trainer, one of the most common issues I’m asked to help with is fear of thunderstorms. To solve this debilitating problem, I’ve collaborated with sound researcher Joshua Leeds and concert pianist Lisa Spector, founders of Through a Dog’s Ear, to develop the Canine Noise Phobia Series.” - Victoria Stilwell By combining progressive sound effects, the specially-designed psychoacoustic music of, and Victoria’s reward-based reinforcement protocols, the Canine Noise Phobia Series is an innovative new desensitization tool that not only helps reduce the anxiety suffered by noise-sensitive dogs, but also reduces the likelihood of common sound phobias from ever developing. ed by the belief that someone or something is dangerous, likely to cause pain or is a threat to survival. Phobia. (n) A persistent, abnormal and irrational fear of a specific thing or situation that compels someone to avoid it despite awareness and reassurance that it is not dangerous. Dogs that have a fear of thunderstorms often go on to develop a full blown phobia that becomes deeply ingrained and highly resistant to change. Thunderstorm fear or phobia is very common and is experienced by dogs all over the world, and is especially prevalent in areas that have severe weather patterns. Dogs of a more sensitive nature or those that suffer with other anxieties are more likely to develop a fear or phobia, and whether this is triggered by a single traumatic episode or prolonged exposure, the result is often distressing for dogs and their people. Without extensive behavioral therapy and management strategies, fears and phobias will become chronic and severely impact a dog’s ability to cope when a thunderstorm rolls in. Through a Dog's Ear sets the standard in the field of canine music therapy. Co-founded by psychoacoustician Joshua Leeds and concert pianist Lisa Spector, Through a Dog’s Ear music has been clinically demonstrated to reduce canine anxiety issues and is used in shelters, dog rescues, and animal facilities worldwide. Note: Dogs who suffer from fear of thunderstorms are often negatively affected by triggers other than the sound of thunder and rain. Changes in barometric pressure, lightning flashes and static charges can also play a role in thunderstorm phobias. While this CD will help recondition the dog to the sounds experienced during storms, it is very important that you also hire a professional positive reinforcement trainer to develop a behavior modification regimen in extreme cases. We recently adopted a two year old mixed breed dog from a rescue organization and soon found out that he is terribly afraid of thunder and lightning. He displayed many of the common symptoms of anxiety (e.g., trembling, lip licking, and seeking comfort in a windowless bedroom closet) until the storm moved on. Neither of our two previous dogs were afraid of storms so learning how to best help him deal with his anxiety was new to us. 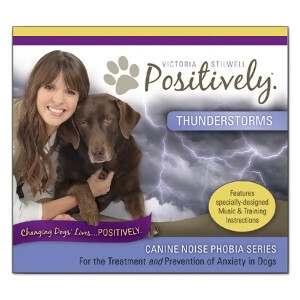 Fortunately, we came across an article that referenced Victoria Stilwell's Canine Noise Phobia series - Thunderstorms. We quickly ordered the CD and we started the desensitization process the day it arrived. We know that it will take a while for our dog not to be anxious during a thunderstorm, but he is already showing good progress. We had another heavy thunderstorm this week and he was much less anxious than he was during the previous ones. Thank you for helping us help our dog! !